We use own and third party cookies to improve your experience and our service. Please accept before continue browsing. Classy Polo for handsome vimmers. - On the back of the polos, we print :wq! 'by default'. If you prefer another command or simply nothing, please note it in the 'Comments' field of your order. The printing technique of this text on the back of the polo is textile vinyl. The price of the polo does not vary. 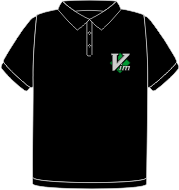 For each polo, we donate 3.00 € to Vim.